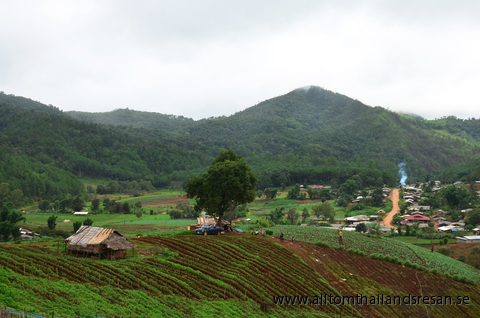 Mae Hong Son is a small town, surrounded by mountains and jungle. The town is close to the border to Myanmar. By the year 1965, it was isolated from the rest of the country and you could only make your way to the city on an elephant back. Mae Hong who is often shrouded in morning mist from the mountains and the place has been dubbed the "Valley of Mists" The city is still small but growing as hotels is built to accommodate the increased tourism to the city. Many use the Mae Hong Son as a base for several wilderness trips into the area's natural beauty. Most of the town's original inhabitants are Shan people, but the city also contain mountain people who come to the city to sell vegetables, fruit and clothes and a lot of different crafts. The city offers taxi in the form of motorcycles which can be rented, and the occasional tuk tuk to transport themselves. Minibuses operated by tour guides and the various accommodations to the different sights as the roads are relatively poor. Recent years there has been a major facelift for the roads in the area especially the way up to Myanmar. The best time to visit Mae Hong Son is the time from November until March, although temperature can drop to just above + at night. Are you travelling on the different wilderness tours, it is important to bring warm clothes with you because temperature may drop much at night. You can travel by plane from Chiang Mai to Mae Hong Son, which has its own airport.